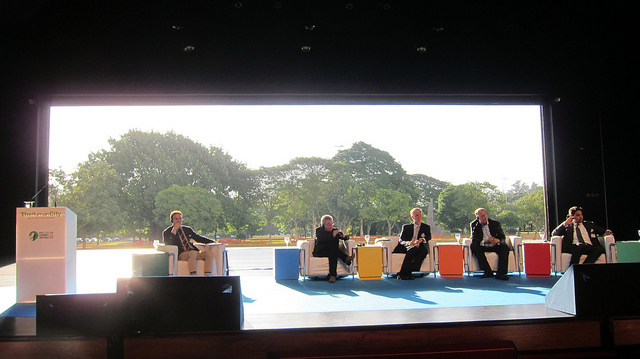 I have had a great time today at the New Cities Summit 2013 here in São Paulo. The theme this year is The Human City and I have a lot of reflections even just from day one, but before we do we need to talk Star Wars. What Stars Wars has to do with São Paulo and the future of cities will I hope soon become clear. 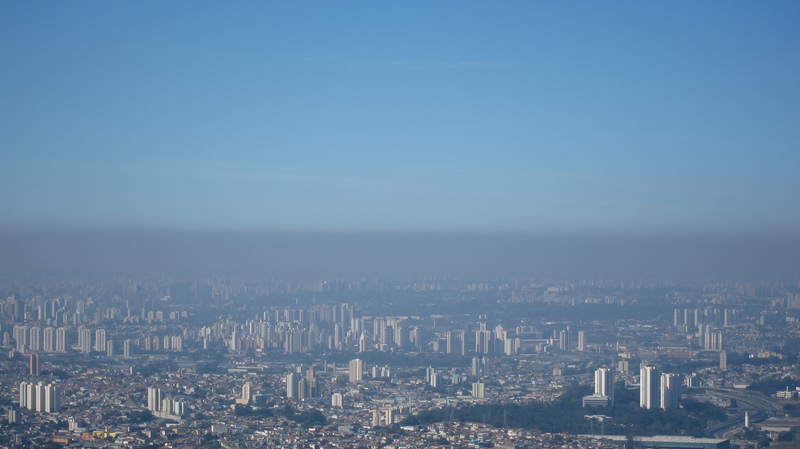 Last week in Brazil was a major holiday, but Maria and I stayed in São Paulo. Millions leave the city during holiday periods, and this sprawling metropolis almost becomes pleasant, even more so this year with a phenomenal downpour which cleansed the filthy air. Maria you may be amazed to hear has never seen Star Wars, and so I took this opportunity to educate her in the ways of the force. We began on Thursday with Star Wars, and followed up the following nights with The Empire Strikes Back, Return of the Jedi and because she liked these so much we then also watched Revenge of the Sith and Attack of the Clones. On one of the DVDs was a documentary called Anatomy of a Dewback and this in theory was about how George Lucas was finally able to go back to the original Star Wars and animate one of the creatures from Tatooine when remastering the film. It was not just a case of adding an animation to the original footage, the entire scene was recreated from scratch, just for one shot lasting eleven seconds. The documentary was fascinating, and I can really recommend that you watch it. The love, care and attention of the many different artists and craftsmen who worked on this scene was quite unbelievable, as was the entire Star Wars project. Maria and I also then watched a 1977 documentary on the making of the original Star Wars and this too was amazing. Maria is a fan of Joseph Campbell who of course helped inspire George Lucas to write the story and screen play, and in the documentaries George really is able to articulate with absolute precision his vision for each and every detail of each and every scene. But Star Wars could never have been produced without an exceptional team of people working on three different continents developing and producing special effects, models, scenery, studios, film sets, sound effects and musical scores all of which then had to be fused and melded together to form not only a coherent narrative but a singular visual tapestry. This could only have been achieved with dedication arising from a deep love of their various crafts, and their desire to tell such a magical story of adventures in magical galaxies far far away. How different the experience is of working in many modern organisations where there can be so many disconnects, from the leadership downwards, so many hidden agendas, competing objectives, misconstrued dialogues and wasted efforts. George Lucas was able to inspire something magical in the creation of the many different worlds in Star Wars, but when we look at what is happening with our earth bound cities, the reality is so different. It was also interesting for me to watch Episodes I and II, especially as they had seemed such a let down at the time of their initial releases, but I watched them again with new ecological eyes, and the symbiotic relationships emphasised by Jedi Qui-Gon Jinn (Liam Neeson) and in the relationship between the Gungan people of underwater city of Otoh Gunga and those humans from the capital city of Theed on the planet Naboo. This is a technological planet but one where technology and people are in harmony with nature, unlike the planet Coruscant, a planet which is entirely covered in a city. It is the centre of the Star Wars universe, the main hub, and is therefore the most influential and richest. Flying over Caruscant for me, coming from Scotland, a country of 5 million people, is not too dissimilar to flying over São Paulo, a metropolis of around twenty million people, generating 12% of the annual GDP of the sixth largest economy in the world. My photo above shows you just how polluted this city is, and of course the city has many many problems which I do not need to go into here. But São Paulo and Brazil are moving more and more into the global limelight, and it was therefore extremely appropriate that the New Cities Summit this year was hosted here. Before jumping straight in to a discussion about the summit, I want to revisit a slide I have talked about a few times as it comes from Rob Hopkins, founder of the Transition Towns Movement of which I and this blog are a part of. His slide summarises a number of different studies which have examined the stories we tell ourselves about the future. Ron always notes how so many science fiction films depicting the future only depict technological societies most of which are dysfunctional with little vision of how humanity can live in harmony with nature. 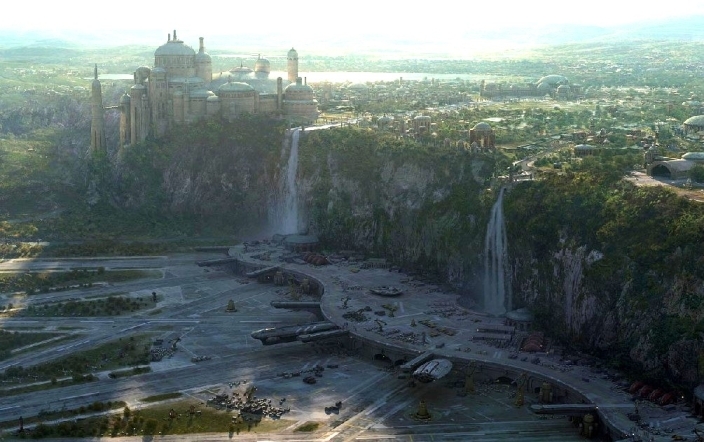 The planet Naboo in Star Wars is a rare exception, and it is always important to think about what the stories are the we are both telling the world and which we tell ourselves. I will come back to this slide when summing up the day at the end of this article. 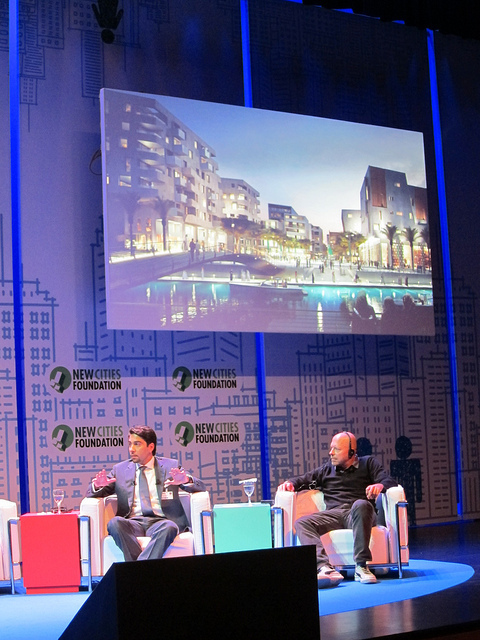 I was a guest of the New Cities Foundation who were hosting this global series of summits. 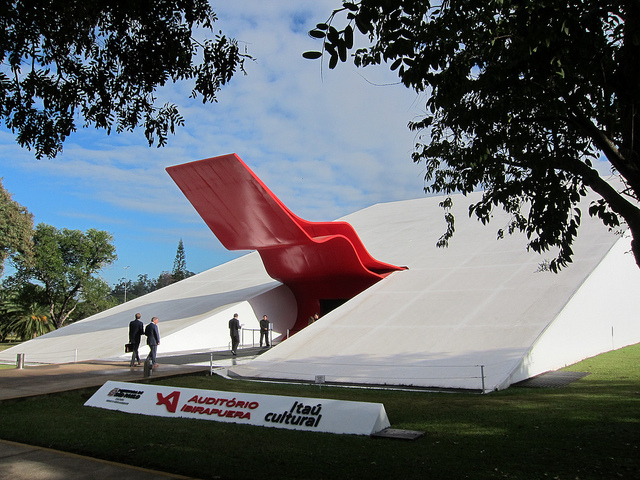 The event is being held in Ibirapuera Park, in the auditorium and pavilions designed by Brazilian architect Oscar Niemeyer, two buildings which themselves would be quite at home in a Star Wars film. The event has 90 speakers from 20 countries presenting to 800 delegates from 34 countries, and it goes without saying that in this review of day one I will only be able to list a few of my own personal highlights from the full and varied agenda. 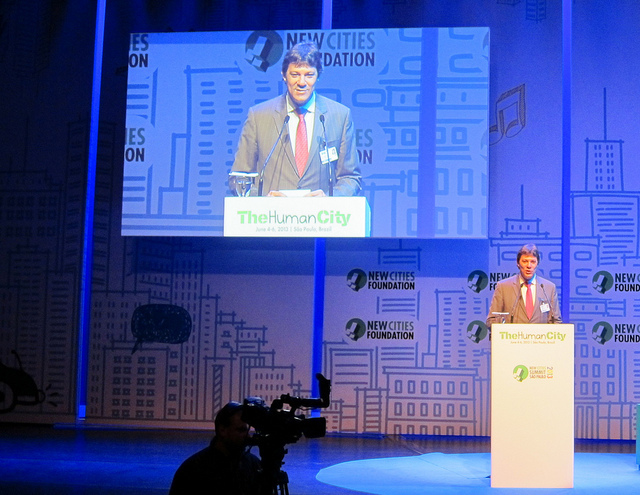 Opening the day were Mathieu Lefevre, Executive Director and John Rossant, Chairman of New Cities Foundation who discussed the prediction that by 2025 60% of the world’s population will be living in cities. 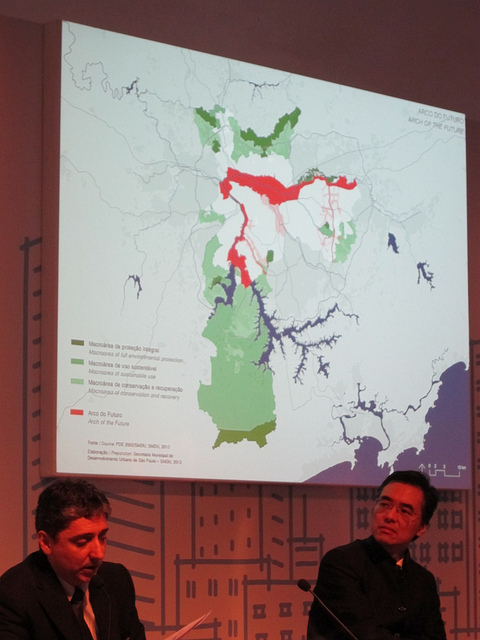 In Brazil today 85% of the population already live in urban areas. The keynote speech was by the Mayor of São Paulo, Fernando Haddad, who noted that the Economist magazine had this week reported that São Paulo is the best positioned city in Latin America with the greatest growth. He did though note how Brazil is still suffering from an “affliction from the 1930s” and this was its “top-down” political structure, a theme that many other delegates would also mention. He also noted how the extreme mobility issues of the poorest denizens here spend between 2 – 4 hours a day travelling to work. This is one of São Paulo’s great tragedies, the lack of infrastructure, and one of the many issues the summit set out to address. 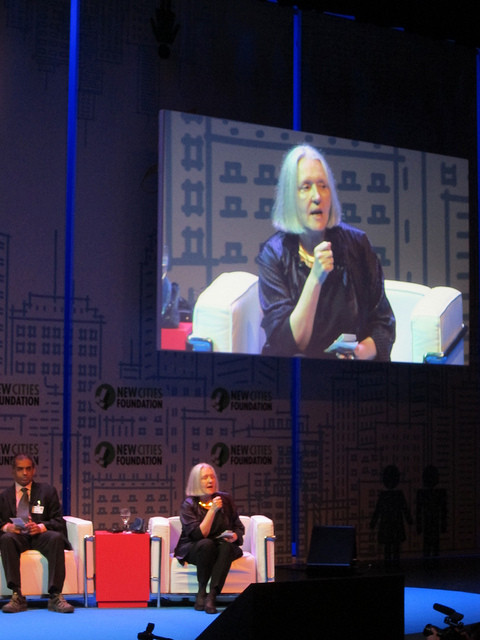 The opening plenary session asked “What is a Human City” and it was wonderful to hear Saskia Sassen open her remarks by explaining how a dense urban space is not a city simply because of its density. She has a rich mental model and conceptualisation of what a city is, system and complex. In her views cities are complex systems which are “incomplete” and this is in fact a good thing since it allows cities to reinvent themselves. She also noted two key new technologies which would allow cities to move from being polluters to purifiers. Both technologies are based on exploiting natural bacteria, one of which can purify human sewerage and convert it into biodegradable plastic, and the other of which deposits calcium on concrete which purifies air. As you can see from my photo of São Paulo, these can not come soon enough. Sitting next to her was Ashwin Mahesh from the National Institute of Advanced Studies in India, and he talked about the need to re-envision education, the topic I have addressed myself in my previous article on the future of education. He was a little controversial in saying that “if we got rid of most universities no one would notice” but he was making the point that we need to re-envision what education is and what it is trying to achieve, since we are not teaching young people to solve complex problems. This also relates to my previous article, which looks at complexity science as taught by the Santa Fe Institute. Understanding complexity and complex systems requires us to develop new mental models and forces us to contemplate the dynamic non-linear relationships between entities. Asking the first question of the day was the very delightful Lady Barbara Judge CBE who I believe is a trustee of the New Cities Foundation as well as Chairman of the UK Pension Protection Fund and who was also chairing a breakout session. She hit the panel with what can only be described as a blunderbuss of a question, hitting them with the c-word with both huge gusto and aplomb. “How can I protect my investors when there is so much corruption?” she asked, clearly reflecting her key concern which is in the financial realm of life. The summit had many breakout sessions and it was hard trying to choose which to go to. The first I went to was about large scale change in São Paulo, and was chaired by Vera Brandimarte, editor of Valor Economico magazine. This session was about the poor of São Paulo, and she mentioned the many challenges of the lower class such as transportation, violence and health, all of which affect all of us who live here, although the poor to a far higher degree of course. It was interesting to hear from Fernando de Mello Franco about a new project in São Paulo, Arc do Futuro (The Arc of the Future) which is where most of the development efforts will be focussed on in São Paulo. Franco talked a lot about systemic understanding of problems, but I am not too sure how this particular vision will pan out for the city, and what it will mean for those who are not in the arc, highlighted in the photo above. I had the opportunity to meet many interesting people as you can imagine in the many networking breaks and over lunch. 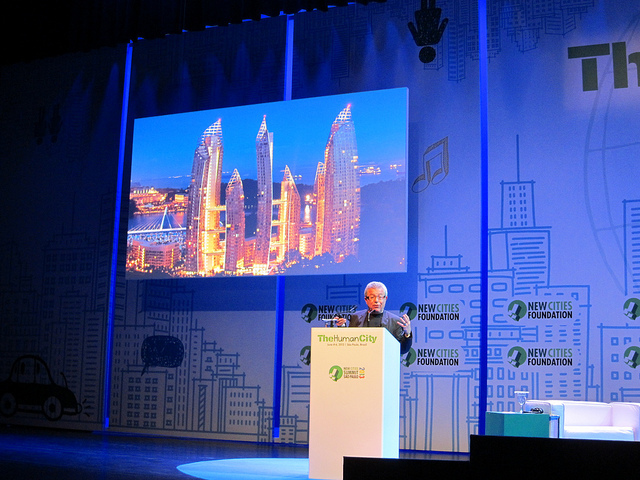 The afternoon began with another keynote from architect Daniel Libeskind. He is an architect entirely focussed on high density high rise projects it seems, and to be honest his vision of life in future cities really did not float my boat. One aspect of life in São Paulo I did not hear mention was the fact that the middle and upper classes leave the city on Fridays for their country and beach residences. It is one thing to extol high density high rise living, but the inhabitants of São Paulo certainly seem to treat it only as a place to be near work and not as their ideal way of life. 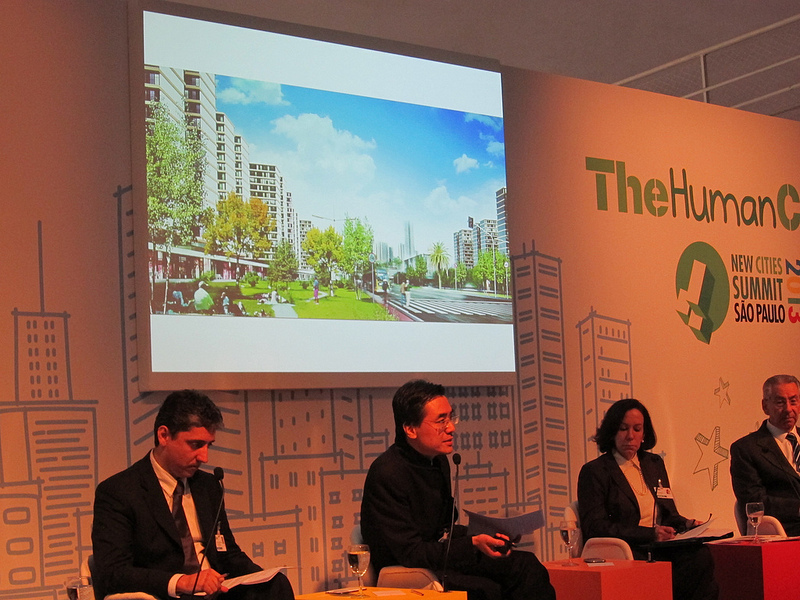 Daniel was joined on stage with a number of panelists for a session discussing the future of urban planning. Fahd Al Rasheed discussed his very thought provoking project which is his role in building an entirely new private city of two million inhabitants in Saudi Arabia from scratch. This raises many issues relating to governance, since there are no elected officials. He did suggest that people could vote by their level of investment in shares in his company, but this made me uncomfortable due to the obvious exclusion of the poor. It was clear though that Fahd does have a concept of sustainability which covers ecological, economic and social factors, and he noted how the master plan for the city had changed radically in the last seven years. Otacvio was applauded by some in the audience for his attempt to stand up for those with no voice, but it was clear that he had really hit a nerve for many Brazilians listening to him. Unlike George Lucas who had a great gift for engendering a shared vision and singularity of purpose in his team, here at this event the lenses through which different people both see and experience life in São Paulo was in laser-sharp focus. During the question and answer session one researcher from University São Paulo took to the microphone to provide a more positive vision of Brazil and Brazilians, and asked the audience to remember that long term planning could not have been possible during their many years of hyper inflation. Maria tells me about family life where all food had to be purchased on the day of receiving the month’s wages, otherwise it would have been valueless at the end. This researcher also talked about Brazil’s lack of resources, but for me as an outsider I see Brazil as insanely rich, it is just that with the corruption resources get channelled into private bank accounts and not into much needed social and infrastructure projects. As we speak Brazil has spent the same amount of money on the 2014 World Cup as the last three world cups combined, and there is little evidence of improvements in infrastructure as promised, only a few new stadiums. Another current problem reported on the news is the lack of capacity in ports, meaning that lorries leaving Brazil via the port of Santos as queuing for mile after mile on the motorways for lack of anywhere to park, and this is causing huge nightmares in that region as you can imagine. During this question and answer session something quite amazing happened. The organisers decided to raise the back wall of the auditorium, treating us to a wonderful view of the trees in the park. My whole sensation of being in the building changed, and I really felt the connection to nature, having been suffocating in visions of high density high rise buildings. I do not know how symbolic this moment was for others present, and I would have loved someone to have really dwelt on this moment and reflected upon it, but I think the impact must have been felt by all present. 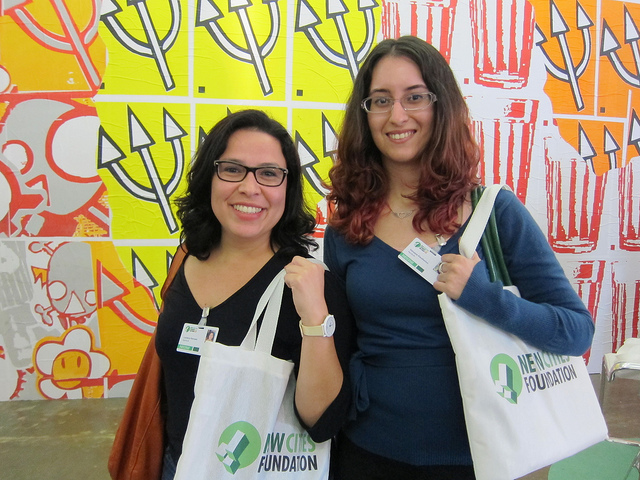 After this session it was great to bump into my friends Luciana and Vanessa from Ágora Lab. A few weeks ago I gave a talk on complexity, transition and smart cities in Florianopolis at the invitation of the Ágora Lab team and so it was great to catch up on what is happening in both Florianopolis and also Rop de Janiero where Luciana and Vanessa are based. Overall it really has been a very remarkable day, listening to some very thought provoking presentations and meeting and catching up with many great people here in Brazil who are all doing fantastic work attempting to overcome deeply challenging obstacles, entrenched mindsets and a vastly complex political landscape. 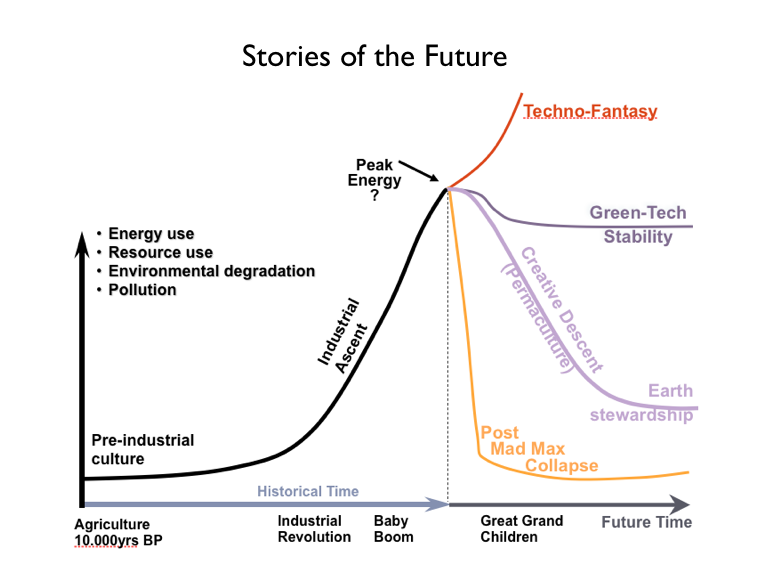 I mentioned stories of the future at the start of this article, and it seemed to me that perhaps the majority of presenters have as their story techno-fantasy. Yes people did mention sustainability, but this was all in the name of growth, economic growth and a population of nine billion people. I do not recall anyone asking a question as to whether or not continued economic growth was possible, although Jay Collins of Citi Bank did soberly mention the fact that 70% of funding of all global infrastructure projects come from European banks, and they are quite possibly the most non-sustainable and non-resilient systems on the brink of collapse right now. Although the emphasis was on human-centric cities, little was mentioned about the move from being consumers to guardians of life on earth, but in conversation I certainly mentioned to people about the amazing work Transition Towns Brasil is doing in communities, and there are certainly many other great projects working withy little publicity to really improve both living conditions for the poor here who are in the vast majority, and other projects protecting the incredible and diverse nature Brazil has. My comments do have to be tempered with the fact that there were many sessions happening in parallel, and I only wish I could have attended them all as the line up of speakers was outstanding. São Paulo certainly does have the ability to reinvent itself but I shall keep my own reservations about the likelihood of this happening and how the challenges could perhaps be addressed and overcome for a later article. Tomorrow will I am sure be equally interesting and perhaps will have a few more surprises and provocations like today and I hope this article has been interesting enough for you to want to come back and see how things unfold at this very excellent summit. Excellent job. I had often wondered about how they keep all those space ships floating around without an Eco-disaster. Similar story with Star Trek universe.